If you are starting with chicks then you have around 6-8 weeks to get your coop built. Probably less if you have them in your bathroom or garage – believe me you won’t want them in there for too long 🙂 The clock is ticking. Unless you are super talented at woodworking and building things from your imagination you would probably be better off buying some plans (or creating your own if you are that way inclined) or just buying a chicken coop. In most cases buying a chicken coop means either a kit (you get all the parts pre-cut, screws, and a sheet of instructions to put it together) or a craftsman will come along with a coop they have already built or their own ‘kit’ and put it up for you in your backyard. For obvious reasons the craftsman option is more expensive but should in theory be better quality (unless they are not so much a craftsman and more a chancer who has bought a cheap kit somewhere). The chicken coop kits you can buy and put up yourself in a few hours (usually) tend to be cheap quality wood and are not always cut exactly how they should be (there might be a little bit of adaptation and swearing to get it looking how it should) but for the price are generally pretty good value. I have had a couple of cheap coop kits in the past and apart from being a lot smaller than they look in the photos they were pretty much as I expected (cheap quality wood but quite attractive looking and did the job). You might even do as I did and get a cheap coop kit as your first coop and then when the chickens outgrow it keep it on as a spare (to keep new additions seperate, hospital coop, broody coop etc.) – mine still gets used daily as a dustbath and additional private nestbox (at least Goldie thinks it’s her own private nestbox!). They will also need some outdoor space of at least 10 square feet each. When you are building a hen house you will also need to include 1 nestbox for every 3-4 hens . Chickens like to roost. 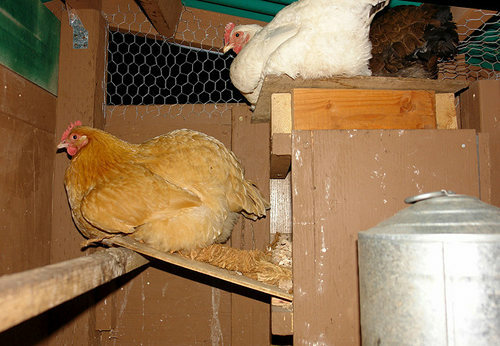 A roost doesn’t have to be really high – if you have a small hen hutch then they might just be a few inches off the ground. 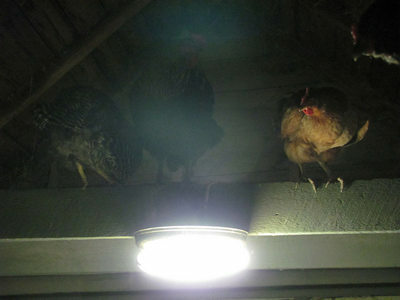 If you do have a big walk in chicken shed then the roosts may be a few feet high. The higher they are, the more room needs to be allowed in front of them for your chickens to gently swoop down from. A straight five foot drop onto the floor could do their feet and legs a lot of damage. They tend to roost at the highest place possible so in addition to ensuring there is plenty of room for them to get down from it is also an idea to make the nestbox(es) lower than the roosts (or on the same level). For a large number of chickens some people use a staggered roost (like a ladder) – placing roosts directly above one another would make for some quite messy and unhappy chickens on the bottom! This may have already been decided for you depending on where you live. For instance if in Ann Arbor the chicken keeping permits you can apply for are for two hens or up to six hens. If you are applying for a permit that allowes up to six hens it might be that (space permitting) you want to build a coop big enough for six hens, even if you were actually intending to only keep four (for instance) so that you could add to your flock in the future when the original ones may have stopped (or greatly reduced) their egg laying. Some hens produce more eggs than others. Certain breeds can lay 5 eggs each a week (or more) so if you had 6 hens that could be 30 eggs a week. They can soon take over your kitchen if you don’t have a use for that many (of course friends and neighbours are usually more than happy to receive eggs as gifts). As time goes on your good egg layers will reduce the number of eggs they lay so unless you intend to replace your hens every few years you could end up with a coop full of hens and only a handful of eggs being laid (they will still make great pets though – and produce plenty of droppings for gardeners). Of course the primary users of any coop you build or buy will be your chickens and it must be ideal for them (secure, dry and draft-free but still well ventilated) but you should also consider yourself. Is it going to be easy to clean out? Can you get at the eggs easily? Will you store their feed and bedding etc. in your house or in theirs? Will any stored feed be protected from mice/rats etc. Can you get at the things you need to get at without having dismantle everything or having to walk/carry things far. Remember : whatever you plan for them – they will do want they want to anyway.